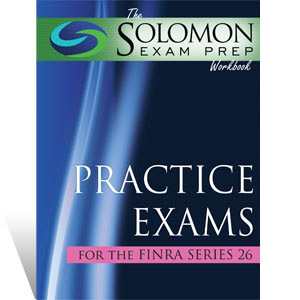 The workbook for the FINRA Series 26 exam features the same great questions as the industry-leading Series 26 Online Exam Simulator but in a go-anywhere format. The Series 26 practice workbook includes five (5) full practice exams with answers and detailed rationales (shipping & handing will apply). I passed my Series 24 today with an 80% thanks to Solomon Test Prep! I found the most benefit from using the practice exams as a learning tool, reading each answer explanation as I went along, regardless of a(n) correct/incorrect response. I found that for this exam, understanding the concepts is equally as important as memorization! Good luck!